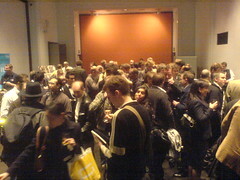 Yesterday, Mobile Monday London held its 6th event at the RIBA hall. 120+ people showed up to hear speakers and panelists pontificate on the meaning of "Mobile Web 2.0" and to enjoy the hospitality of our hosts for the evening, AOL! What's next up for Mobile Monday London? On May 8th, the theme will be Mobile User Experience. Interested? Join the mailing list to find out more and participate in the vibrant MoMo London community.